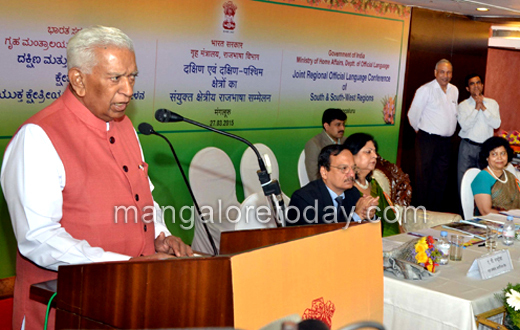 Mangaluru, March 27, 2015: Addressing the Joint Regional and Official Language Conference of South and West Regions, organized by the department of official languages under the home ministry, at Hotel Ocean Pearl on March 27, Karnataka Governor Vajubhai Rudabhai Vala advised that regional works of literature be translated to Hindi, stating that strengthening Hindi the national language will promote national unity and improve understanding and harmony. He said that the South of the country is like a vast ’Ganga of knowledge’ the cradle of great thinking and scholarship. The great scholars and saints have written deeply valued tomes in classic languages like Kannada, Tamil, Telugu, Malayalam and so on....this knowledge should be exploited to its full potential. These stores of knowledge should be translated into Hindi so that the whole of India and more read them. Constitution of India recognizes Hindi as the national language. All languages have value and we admire all, but we should show the same enthusiasm in learning Hindi as we do in learning English. Governor Vajubhai Vala said that all people should have a life with direction. If one strives for others he is human but if he works selfishly he becomes inhuman. Our life styles are important, our assets hould be useful for others generously. The Governor went on to say, many languages and dialects are there but the whole Indian nation is one. Bharath is strong from its thoughts, and thought is strong due to knowledge. Language has the power to unify knowledge from every corner of the country India, it is Hindi that unites all knowledge. Make Hindi strong so that India will be stronger. There should be no differences over language. A large percentage of out Indian population know some Hindi at least. All languages must be acceptable. It will go a long way in unifying Bharath in harmony. He explained, law was written in English in British times and so we learnt English. If laws are written in Hindi, the future generation will learn Hindi surely. Snehalatha Kumari of Rajbhasha Vibhag presided over the programme and said that the convention is to promote the use of Hindi all over. A language becomes important when people use it incrementally in their everyday lives. Hindi is an easy and effective language popular with the people. It is not just a medium of expression alone, its roots are with the tradition and culture of most people. Hindi as a language is rooted culturally and connects Indians at home and over seas. Kumari stated the cash award for ’Rajbhasha Gaurav Puraskar’ has now been increased to support the official language better. Awards were given away to various individuals for their contribution to make Hindi better acepted. Poonam Junaid and Malai Chatterjee of Rajbhasha Vibhag, Vijaykumar of Corportation Bank and others were present.